If you could only hear this podcast in full holographic glory. 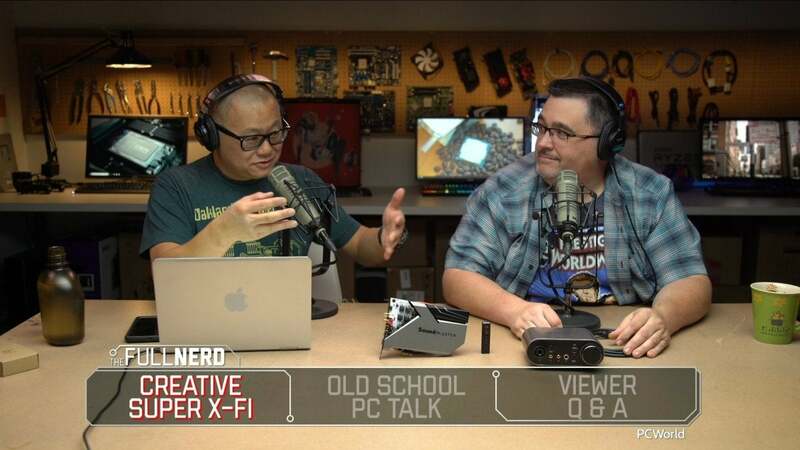 In this episode of the Full Nerd, Gordon Mah Ung and Adam Patrick Murray are joined by Creative Labs’ Ryan Schlieper to talk about Super X-Fi, old-school computers, and a sneak peek at the newest Sound Blaster! First the crew discusses Creative’s breakthrough “holographic audio” dongle known as the Super X-Fi, which promises to pack a surround-sound system into your pocket. The Super X-Fi is so impressive, you won’t believe what Adam says about it. And then in a surprise move, Ryan unveils Creative’s new Sound Blaster AE-9 with a break-out box and a 6-pin PCIe power plug. Finally, Gordon and Adam talk about Ryan’s new liquid-cooled PC build and how he chose his parts, before it all goes completely off the rails as the old men reminisce about the good old days. You know how you’re complaining about RAM prices or RTX? Feh. Back in the day, you had to walk uphill both ways to the computer store in the snow and it would be closed! You can witness it all in the video embedded above. You can also watch The Full Nerd episode 77 on YouTube (subscribe to the channel while you’re there!) or listen to it on Soundcloud if you prefer the audio alone. This story, "The Full Nerd ep. 77: Super X-Fi, old-school computers, and an unveiling" was originally published by PCWorld.